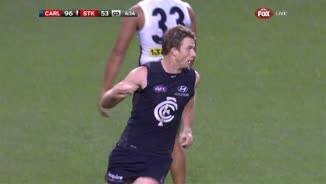 FULL TIMECarlton came and they conquered today at Etihad Stadium. 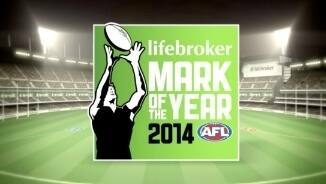 With the exception of a second quarter revival Carlton had it their way for most of the game to win by 85 points. GOAL BLUESTime to ice the cake, Carlton. Yarran is sitting on his banana lounge inside 50 undisturbed. He gets off to pick up the ball and kick his third goal. Not a bad day's work. GOAL BLUESCarlton may have found something up forward with Simon White. He marks a skidding ball close to his chest and then goes back and kicks it beautifully. He has four goals! The Saints need to finish off the game with something but they appear to have crashed to a halt. GOAL BLUESFrom the stoppage the Saints are applying very little pressure. 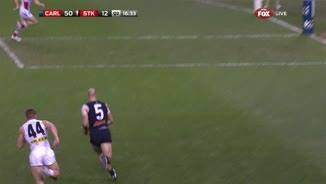 This allows Docherty a saloon passage to the ball and he runs around and bangs it through from 45 metres out. Menzel is back on the field but he receives a bump and feels for his shoulder immediately. He needs to get off the field and pronto. BEHIND BLUESJohnson marks 20 metres out and he is looking for his first career goal. He sends the kick on it's way and it's an anti-climax. Carlton are running themselves into some form and could have a big say in shaping the final 8 given the abundance of talent they have on display. GOAL BLUESCasboult outmarks a man virtually half his size in Leigh Montagna. He could have played on but he goes back and kicks it through from the goal square. GOAL BLUESThe strong pack contested mark is about to be re-trademarked to a certain Levi Casboult! He does it well and does it often! After his latest effort he kicks his third goal for the day. Menzel is off the field getting his shoulder attended to. It doesn't look to be as bad as Ablett's injury and that's good news for the Blues. BEHIND SAINTSSteven provides the short option and he takes the mark. His shot from 45 metres out misses to the right. The Saints will be looking to win this final quarter to take something away from the match. Blues InterchangeTroy Menzel off due to an injury. Welcome to Etihad Stadium for the Carlton v St Kilda Round 16 clash. 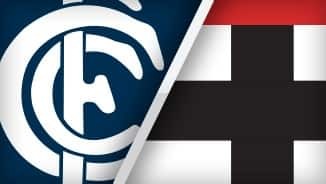 A POWERFUL display from Carlton's forward line has inspired the Blues to end their five-game losing streak with an 85-point win over St Kilda at Etihad Stadium. Lachie Henderson, Levi Casboult and Simon White booted four goals each as the Blues piled on their biggest score for the season to win 24.7 (151) to 10.6 (66) on Sunday afternoon. It was their second win over the Saints this year after a 32-point victory in round eight. With Jarrad Waite spending a second straight week at VFL level, the three big men made life difficult for Luke Delaney, James Gwilt and Sean Dempster, with 23 marks between them. Chris Yarran showed his versatility to slot three goals and prove a handful for young defender Cam Shenton. 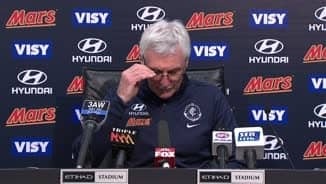 Coach Mick Malthouse said afterwards he was pleased with the contribution to the win of the defensive elements of the Blues' game. "If you kick 20-odd goals and only seven points, you're going OK," Malthouse said. "I've never really thought too much about that; it's more about our manner of defending the ball. "Score-lines look after themselves if you defend well enough." A tight quad sustained by Andrew Carrazzo and a shoulder 'stinger' for Troy Menzel were setbacks for the Blues, although the latter played out the game. A suspected quad injury to Andrew Carrazzo and a shoulder complaint for Troy Menzel were setbacks for the Blues, although the latter played out the game. But while the Blues' forwards thrived, St Kilda captain Nick Riewoldt had a trying day up the other end, with the Saints' woeful delivery into their forward line a major problem throughout the afternoon. It didn't help that prime midfielders Lenny Hayes and Leigh Montagna were missing – Hayes with a groin and Montagna held to no possessions by Ed Curnow in the opening term. St Kilda coach Alan Richardson said afterwards Montagna had been 'outworked' by a range of opponents and had not carried an injury into the game. He was scathing of the Saints' lack of work-rate and the number of players who weren't willing to fight. "It wasn't a long meeting tonight after the game but it was about exactly that - what we saw tonight was not a reflection of the fact we had an inexperienced group, it was the reflection of a group that didn't have a crack for long enough," Richardson said. "Those questions have been asked a couple of times this year but today was really disappointing." The Blues dominated at the stoppages with Carrazzo winning four clearances in the first quarter while Andrejs Everitt helped spread the Saints wide and took seven marks. Everitt was terrific in a range of roles, including running with Montagna in the second half. The decision to start Riewoldt on the wing after quarter time helped change momentum, with Trent Dennis-Lane and Rhys Stanley left in attack. The margin of 26 points had become 44 when Menzel kicked the Blues' third goal of the term six minutes in, but the Saints booted five of the next six to make the half-time margin 15 points despite Montagna still struggling to shake Curnow. He lined up in different positions, moved to all sides of the square and tried unsuccessfully to pick up Marc Murphy in a bid to get into the game. The Carrazzo injury came late in the quarter came after the Saints had already made their move with Riewoldt combining with David Armitage, Jack Billings and Shane Savage in turning the tide. But after the break, Curnow moved on to Jack Steven and continued his good form by keeping the reigning Saints' best and fairest winner to six second-half touches. All the good work done by the rebuilding Saints came undone as the kicking sloppiness returned and the Blues piled on 14 second-half goals to three. The second halves of Marc Murphy and Brock McLean were significant while Andrew Walker racked up 28 touches and took 10 marks for the game. Carlton: Bell replaced Carrazzo in the second quarter. St Kilda: Dunell replaced Dennis-Lane at three-quarter time.